Alain Baxter is Britain's most successful ever skier. He raced on the World Cup for 16 years reaching number 11 in the World. 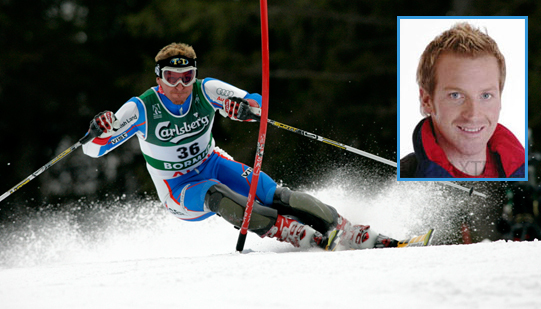 In 2002, he won a bronze medal in the slalom at the Olympic Games in Salt Lake City. In one of sport's most famous cases of injustice, he was disqualified a few days later and despite winning an appeal against the decision to ban him from competition, the medal was never returned. He also won BBC's Superstars competition in 2004, fending off the sporting talents off the likes of cyclist Bradley Wiggins, rowing's Sir Steve Redgrave and swimming's Mark Foster. At ICE we are extremely privileged to have Alain as part of our coaching team. He is a specialist race coach and all those involved on the 4, 6 and 10 week courses will benefit from Alain's expertise in slalom. This often provides a highlight to the course as students chat freely with Alain about his time as a racer as they get better at slalom. During the same week, we have giant slalom coaching provided by ICE's other race coaching staff, rounding off the race week of the course.